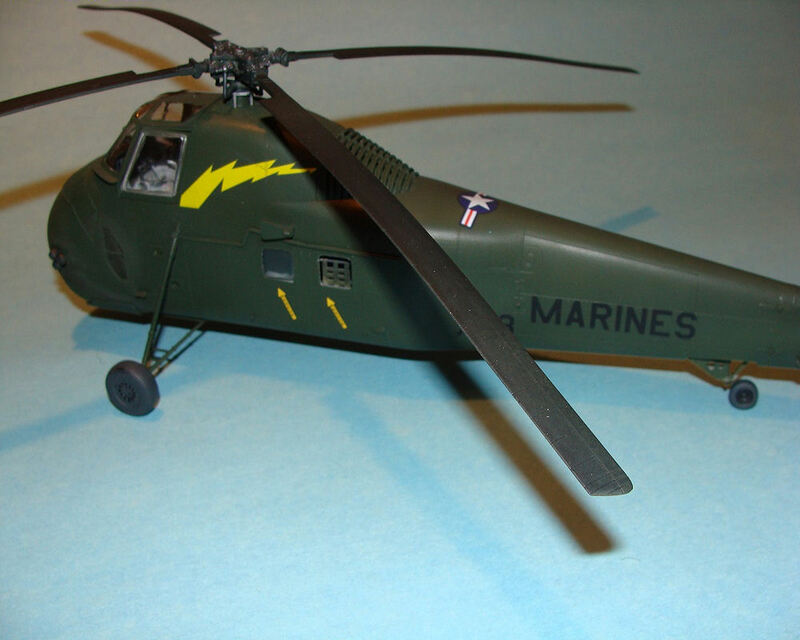 For the longest time, the only 1/48 scale model of the workhorse Sikorsky H-34 helicopter was made by Revell, whose molds at one point were rumored to be "lost at sea." 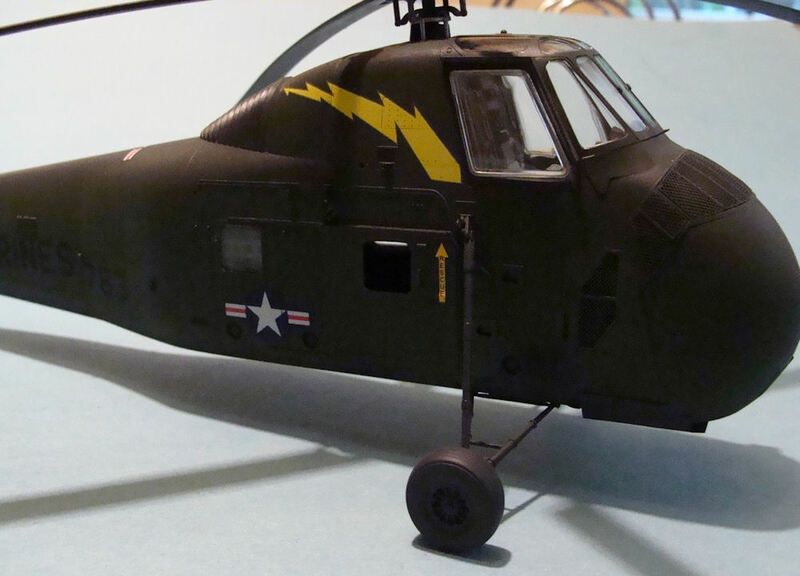 Then, after being missing in action for nearly 25 years and fetching high prices on eBay and elsewhere, the venerable Revell kit was joined by a new-tool H-34 coming from MRC's house brand Gallery Models. The announcement was released in 2012; MRC displayed test shots and box art for two forthcoming versions in Orlando at the 2012 National Convention - a USMC version and a US Navy version. The USMC version is the subject of this review. These are thin, well printed, and in good register. Parts breakdown is conventional, with left/right fuselage halves and separate clamshell engine covers, and a foldable tail rotor assembly. Good use of the photo etch parts includes the prominent grilles on the nose and the exhaust gates on the tail rotor. Surface detailing is scribed, as are the rivets; however, they tend to fade out in places along the top of the fuselage. Raised detail is used when appropriate. 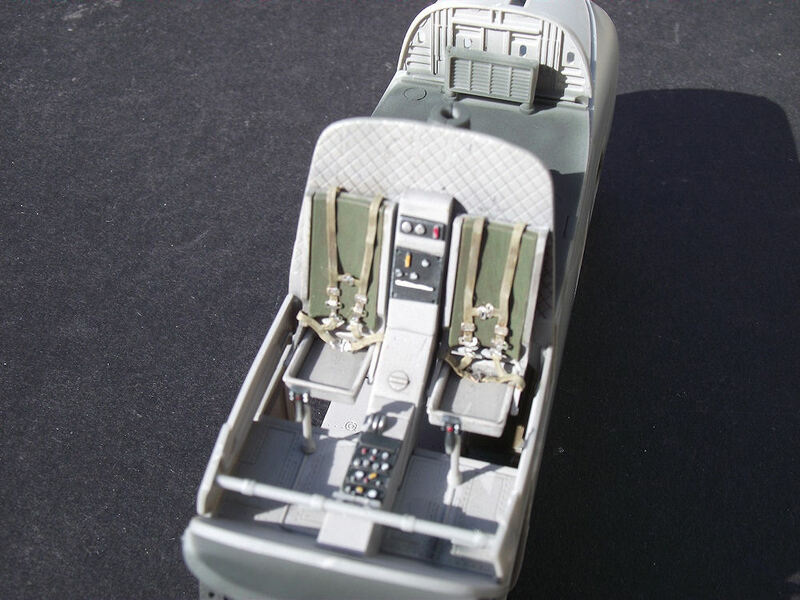 The interior has a separate skin, and options for a number of weapons are provided (apart from the door gun), indicating that further Vietnam-era copters are on their way. Construction went well, although I did make a few notes to pass along to my fellow modelers that might help them out. I found that part B29, the engine push rods, are very delicate, and I could not remove them from their frame without destroying them. Also, the mounting locations for exhaust pipes E1, E2, and E3 are very vague, and I wound up having to reposition them at least three times to allow them to protrude through the engine shroud. Moving to the interior, be very careful as to which holes you open up on the cabin floor for the seats, guns, etc. The instructions show only the holes to be opened, while ignoring the great number that remain flashed-over for other variants. Test fit, test fit, test fit. My only other concern with the construction involved the cabin windows. Two of mine popped out after the model was finished. The culprit is the narrow ledge around the windows that holds them in place. In the future, I would use thin liquid cement, such as Tamiya Extra Thin, carefully applied, rather than the traditional PVA glue that I used this time. Also, pay attention to the parts number callouts; some are mis-called. An example of this is the landing gear braces. The instructions correctly indicate part D1 for the right side, but call for D2 for the opposite, when it should be part D4. Careful attention to these details will save a headache later. The only area of the model that required a more than a normal amount of Mr. Surfacer in the seams was around the belly insert, part A7. Fit was a little loose, but a generous application of Mr. Surfacer solved the problem. Once the seams were cleaned up, the model was primed with a spray coat of Tamiya Grey Plastic Primer, an indispensable part of my modeling arsenal. After a final check, I painted the model with Tamiya JA Green XF-13, which is a close match to the FS number referred to in the instructions. 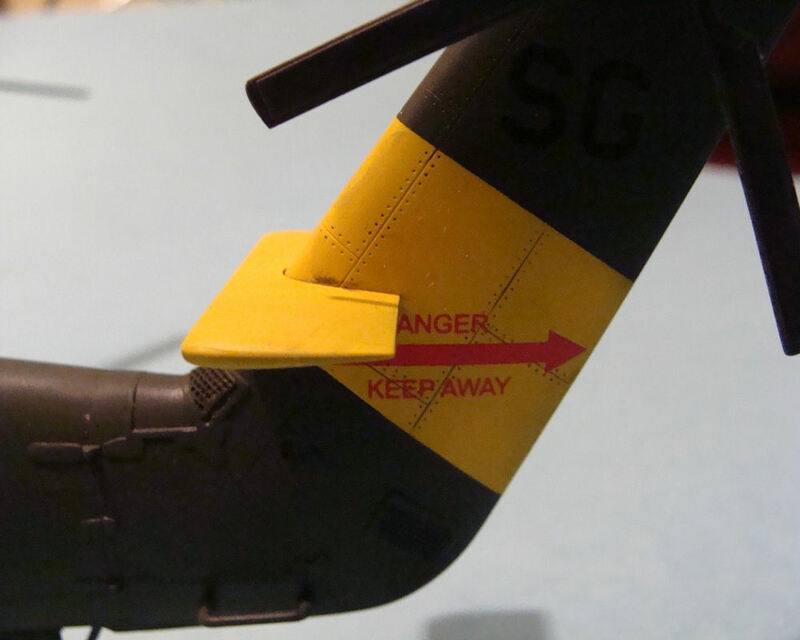 The tail warning stripe was painted Tamiya Flat Yellow XF-3, and the rotor assemblies were sprayed Tamiya XF-69 NATO Black, my favorite scale black. A gloss coat of Vallejo's polyurethane clear gloss thinned with Vallejo airbrush thinner readied the model for decaling. The kit decals worked flawlessly. I chose the option from the unnamed USMC unit with a yellow lightning bolt on the fuselage. I am pleased to report that the decals are quite opaque, and yellow lightning bolts and the white in the stars and bars show no color bleed though. The decals snuggled down into the panel line and rivet detail nicely with only an application of Microset. Again, the decals are thin, so take care that they do not fold over on themselves when they are sliding off their backing paper. I applied another clear coat to seal the decals, and washed a little Flory's dark wash over them to highlight the panel and rivet detail. A final coat of Vallejo polyurethane clear flat finished the project. All-in-all, this was pleasant model to build, although the vagaries in the instructions and fit in places caused a few bouts of profanity to echo through the man cave. As stated earlier - test fit, pay attention to the instructions and part numbers, and take your time, and you will be rewarded with a nice rendition of an H-34 for your display case. I can recommend this model with no reservations to those with experience with multi-media kits and small assemblies. My deepest thanks go to MRC Gallery Models and PMSUSA for providing this kit for review. It was greatly enjoyed. Submitted by Richard J. Burbine (not verified) on Sat, 2018-12-01 20:01. In your article you chose to model an un named Marine H-34, with the lighting bolts. That squadron was HMM-769, based at NAS Alameda, California back in the 1960's The "SG" tail code is actually 5G. 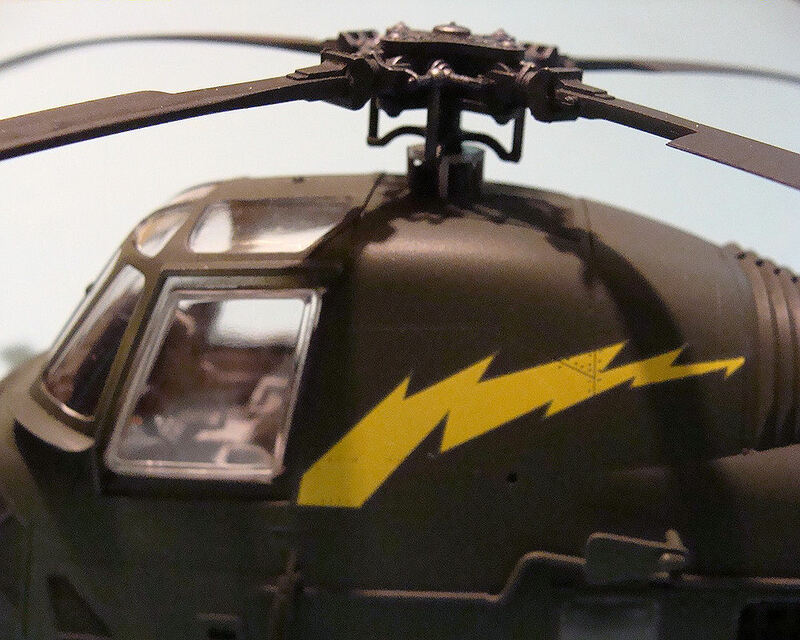 Some of the helicopters in the squadron had the panel behind the tranmission painted red, with gold lightning bolts. How do I know this, you may ask. Well, my late uncle was the squadron's Sgt. Major. And as a boy, I saw these helicopters up close. Somewhere I still have a photo of one of them at an airshow, back in the late 1960's.